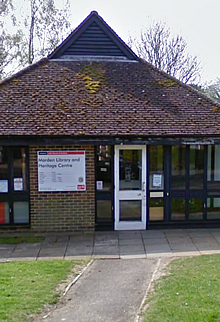 Marden Library and Heritage Centre, High Street, Marden, Kent, TN12 9DP. 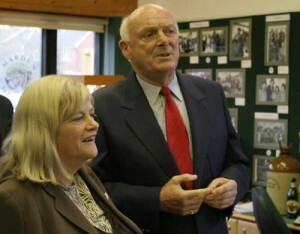 On 23rd March 2008 the village of Marden saw the official opening, by Ann Widdecombe MP for Maidstone, of the Marden Heritage Centre. This was the result of an alliance between Kent County Council Libraries & Archives and the Marden History Group. Labour & furnishings were sourced as locally as possible and it is amazing what talent & generosity of time can be found in a village. Equipped with multimedia technology, display cabinets, furniture & carpet, along with the start of a brilliant cataloguing system, plus two volunteers to staff each library session, we are now up and running. There are still many learning curves to conquer for all of us. We realise that we are hampered by the lack of internet connection and of course there will be the perennial problem of paying the rent. Are we pleased we have pioneered this type of project? I think we would all say a resounding YES. Donations have appeared – from young Charlie who rushed home for his Coronation mug & signed the donation form himself, to an elderly resident who produced a blue pottery vinegar bottle inscribed Marden which she had purchased from the Post Office years ago. We were thrilled to receive the old ticket machine from Marden Railway Station (thoughtfully provided with photos of the railway clerk on a memory stick). Photos, documents, bottles, artefacts have arrived, but also of vital importance – information & identification of photos etc. Greatly appreciated has been the backing from the Centre for Kentish Studies and Maidstone Museum. So where do we go next? Exhibitions will be changed every 3 months; joint projects are to be held with various other organisations including the local school. We need to streamline our procedures and have an ongoing programme of skilling the volunteers who are also carrying out research whilst there is a gap in between visitors. Our experimental project is being watched carefully not only by Kent Libraries & Archives but by other nearby villages & this week we had a visitor from Stock in Essex. The challenge to make ours a Centre of excellence continues. The Heritage Centre has continued to be ever busy; either welcoming visitors or adding to the archives. The community has been brilliant bringing in various photos etc and filling in pieces of the vast jig-saw which is Marden village. The commitment from our volunteers has also been beyond belief, although we always need more as people’s lives change and the amount of time they can give varies. The icing on the cake has been the award for Archive of the Year 2010 from the magazine Family History Monthly. I think the reason that we beat much larger organisations is the fact that we are a community project from start to finish. 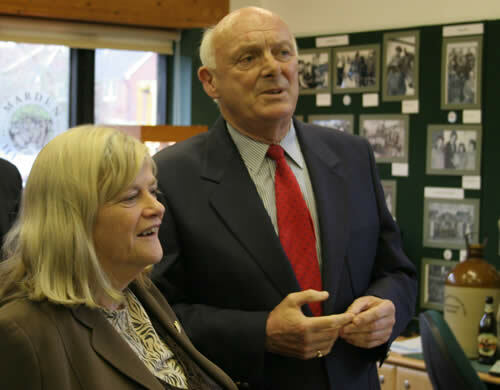 The talent that has emerged from Marden is staggering and we would be no-where without Lester and Jane Cunningham from Onclick Ltd who manage the whole website for us. We have now acquired an internet connection in the Centre and volunteers and visitors make full use of this facility. Exhibitions come and go, visitors come from all over the world (especially during the summer) and we continue to liaise with other groups and archives. At the moment we are involved in a prospective project with the Parliamentary Archives Group and the Centre for Kentish Studies about the Coming of the Railway to Marden. We look forward to the new Kent Archives and all its facilities, due to be opened in 2012 and currently running ahead of schedule. Descendants Day was enthusiastically received and the day had a real buzz about it and proved a meeting point for villagers past and present. As for the future – there are still plenty of ideas germinating and thousands of records to make searchable. Our most exciting present project is the extraction of information from our Parish Chest. A grant from Grass Roots has enabled us to pay two researchers to make a start on the many thousands of records from this, which we paid to have digitised ourselves. Luckily the continuing sale of books and pictures etc has enabled us to do this as well as pay the rent etc. We are not employees of the library as many visitors seem to assume. One Australian said that David Cameron should increase our grant – what grant?